Today we went on the Big Bus Tour. A bus came to take the eleven of us and ChaRon to one of the malls. At that mall, Dr. Tom bought us our Big Bus tickets and we hopped on the big bus that was parked outside. Michelle came with us. Let me just clarify: ChaRon works for RIT Reslife back in the states. She has been visiting for the past week or so to try and help the RIT Dubai campus set up some sort of student affairs and Reslife part of campus. So she joined us for the tour. Also, Michelle works at RIT Dubai. She grew up in Dubai and went to RIT in the US, so she knows a lot about everything in both cultures. She's been a really good resource to ask about pretty much anything. Continuing on, the big bus tour was awesome. We went all around some of the city of Dubai. We stopped and got out to see the tallest building in the world called the Bur Khalifa. It was really extremely tall. Like so tall it was hard to even get a verticle picture of it. At this stop we went inside one of the malls to grab some food. The food court was amazing. There is pretty much every kind of food you can imagine; indian, pakinstani, lebenese, american, mcdonalds, sandwiches, subway, johnny rockets, etc. So many different places. Some of Dubai's city skyline. 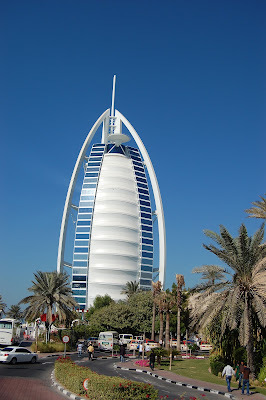 We also got to see the Burj Al Arab, or the famous iconic hotel that looks like a sail. It has a helicopter landing pad on the top floor of the building. Clearly you have to be mad rich to stay in that hotel. The Burj Al Arab hotel. We drove onto the Palm Islands and got out at the Atlantis stop. The Atlantis hotel is insane. The aquarium inside the hotel is amazing in itself. I can't even begin to imagine what the rooms are like. One of the aquarium windows at the Atlantis hotel hallways. After the bus part of the tour, we went on a boat tour on the Dubai Creek. This was my favorite part. The sun had just set, so the lights of the buildings were all turning on. The dhow boat had speakers that described some of the history of the Dubai Creek as the boat floated up the creek and then back to the starting point. I really liked that area of Dubai. It seems like there are tons of places around the creek and everything is close together for the most part and seems to be bustling with activity. 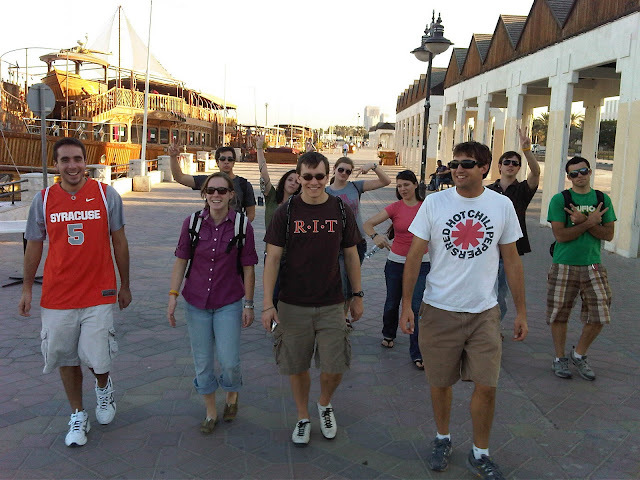 The group all agreed that we would have to take a trip back to Dubai Creek in the near future. The dhow boat that our Dubai Creek tour was on. Part of the Dubai Creek at night.